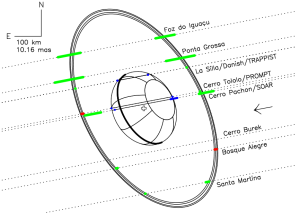 The Chariklo ring system. The dotted lines are the trajectories of the star relative to Chariklo in the plane of the sky, as observed from eight sites, the arrow indicating the direction of motion. We discussed a marvelous paper in journal club on Friday — Ribas-Braga et al.’s discovery of a ring system around the Centaur Chariklo. A small icy body in the outer reaches of our solar system, Chariklo was expected to occult a star last year as seen from the Earth. The shape and duration of this stellar dimming can give astronomers very tight constraints on the size of a body (the same basic technique is used in exoplanet astronomy to estimate planet sizes). Instead of one very deep dimming due to Chariklo itself, the observers were surprised to find two pairs of small dips just before and after Chariklo’s dip. Follow-up observations at other sites confirmed what these initial observations suggested: Chariklo has two, thin rings! 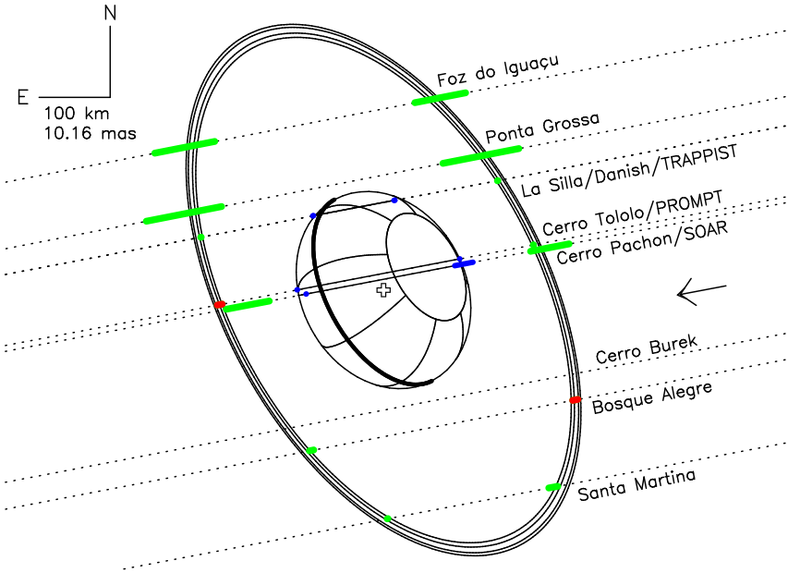 This result makes Chariklo the only body in the solar system, other than the giant planets, known to have a ring system. A ring system around such a small body is very surprising, and it’s not at all clear how it was made — possibly tidal disruption of an even smaller icy body or collisions among small satellites; both scenarios may have contributed to Saturn’s rings. And like Saturn’s ring system, Chariklo’s rings may have shepherding satellites, gently tugging and pushing the ring particles to keep them tightly confined around Chariklo. Otherwise, such a ring system should spread out and diffuse in only a few million years. One of the most exciting aspects of this paper for me was the fact that the occultation observations were mostly made by small telescopes. Boise State has its own 0.4-m telescope at the Challis Observatory. And so I’m hopeful we may be able to contribute to future occultation campaigns such as this one. The broad-band transmission spectral data of WASP-31 b, along with three atmospheric models. From Sing et al. (2014 — http://arxiv.org/abs/1410.7611). We discussed an impressive paper today in journal club, Sing et al.’s (2014) study of the transiting, hot Jupiter WASP-31 b.WASP-31 b weighs about half as much as Jupiter but has a radius more than 50% larger, giving it a very low density for a Jupiter-like planet. Using the Hubble Space Telescope, Sing and colleagues observed several, spectrally-resolved transits of WASP-31 b (i.e., in several different colors), resulting in several of the black data points in the figure at left. The colors of the planet’s transit tells us a lot about the composition and nature of WASP-31 b’s atmosphere. 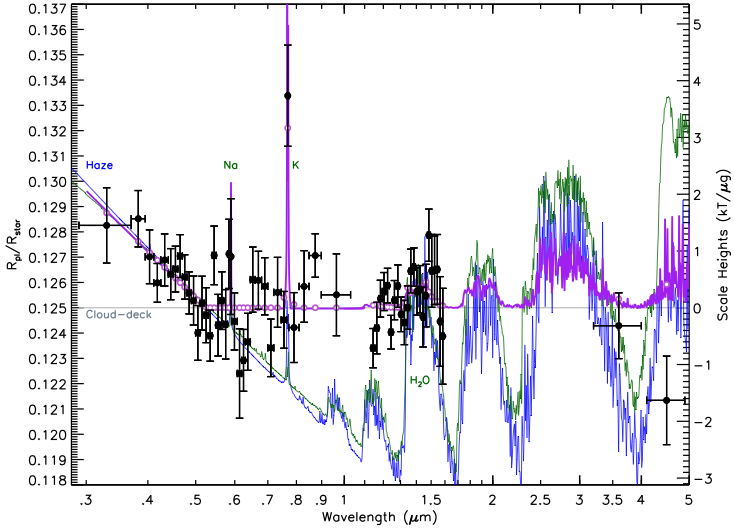 For example, the blue and green curves in the figure at left include spectral features from water, but the black data points don’t show the same features. However, the data points DO show a clear detection of potassium (K) in the planet’s atmosphere (as indicated in the figure). 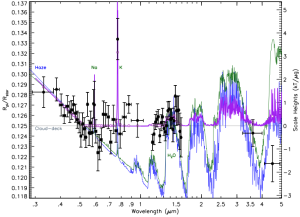 Potassium, while interesting, is not completely unexpected in WASP-31 b’s atmosphere since it is very hot, > 1,500 K.
But the fact that only the very highest point in the potassium spectral feature is seen and not the broad wings on either side probably indicates the planet has a thick cloud deck. Since the peak of the potassium feature results from gas high in the planet’s atmosphere and the wings from lower in the atmosphere, Sing and colleagues can estimate the pressure level of the cloud deck, about 10 mbar. For comparison, clouds on the Earth typically form at about 500 mbar. In the Earth’s atmosphere, 10 mbar is about the level where meteors burn up, so WASP-31 b’s clouds are VERY high in its atmosphere.